What do heart disease, cancer, infections, medical malpractice, and accidents have in common? If you answered causes of death you are correct. It wasn’t that difficult to figure out, right? If I asked you to list the top three causes of death in the United States, what would your answer be? With all the deadly diseases in this world, you would be surprised to know that, according to the British Medical Journal (May 2016), the third leading cause of death in the US is MEDICAL MALPRACTICE. Why the shouty caps? Because it is a staggering number and it is unfathomable to comprehend that approximately 250,000 people die annually as a result of a medical mistake. Researchers from The Johns Hopkins University School (JHU) of Medicine calculate 9.5% of deaths per day are caused by medical errors. That computes to almost 700 deaths daily. Improper impatient assessment, misdiagnosis, failure to properly diagnose, miscommunication, incompetent doctors, and general poor judgement are some of the factors which give rise to medical errors. Because the Centers for Disease Control and Prevention do not require medical mistakes to be reported, nor is it included on death certificates as the cause of death, there is not exact data specifically identifying an overall cause; therefore, the actual amount of deaths due to medical negligence could be higher. The 2014 death of the illustrious Joan Rivers was a result of medical malpractice. Rivers died several days after a routine procedure at Yorkville Endoscopy in New York. Allegations of wrongdoing included that doctors, among other things, performed unauthorized procedures. An investigation by The Centers for Medicare and Medicaid also revealed the clinic made numerus errors which included failing to obtain informed consent, maintaining proper records, and taking photos of Ms. Rivers while she was unconscious. In 2014, Baltimore’s world renowned Johns Hopkins Hospital settled with more than 9,000 plaintiffs for $190 million for failing to properly supervise Dr. Nikita Levy, a gynecologist who was employed by the Hospital from 1988 to 2013. Dr. Levy secretly took inappropriate photographs of his patients. A NY jury found in favor of a 34 year-old Brooklyn, NY mom in 2014 and awarded her $62 million. The plaintiff underwent surgery for an ectopic pregnancy and spent months in intensive care as a result of her colon being punctured during the procedure. She suffered an infection, blood poisoning, and gangrene. She went into cardiac arrest three times, suffered hearing loss, and had to have both of her legs amputated. The jury found treating physicians guilty of deviating from the accepted standards of care. Closer to home, North Carolina settlements include a 1.9 million settlement for a 67 year-old woman who became paralyzed because of alleged negligence and a subsequent misdiagnosis (in 2017), and in 2014, Pitt County Memorial Hospital agreed to pay $13 million to settle a lawsuit claiming negligence against the Hospital’s emergency transport service crew and one of its doctors, who allegedly caused the permanent brain damage of a three-month-old child. I could go on and on with a list of jury awards, as well as settlements which were reached between the parties prior to going to trial, because medical malpractice is a pervasive problem in our country. Diederich Heathcare is a medical malpractice insurer. The insurer did an analysis of medical malpractice payouts in 2015 as reported by the National Practitioner Data Bank and revealed that, alarmingly, the trend is increasing as payouts in 2015 rose in the US for a third year in a row, marking an increase of 1.68% from 2014, with a 3.95 billion paid out in medical malpractice claims. Highest payouts went to victims who suffered quadriplegia, brain damage, or injuries requiring life-long care with an average payout of $1.1 million. Death resulted in 30% of all payouts and payouts for surgical errors rang in at 23%. Where does North Carolina rank? NC falls in the bottom states for medical malpractice payouts, but is the good news for North Carolinians? This remains to be seen because while the numbers of medical malpractice cases and payouts are increasing, tort reform, which is another topic in and of itself, has had an impact on the number of medical malpractice claims filed, as well as the compensation for the same. plaintiff’s injuries, were committed in reckless disregard of the rights of others, grossly negligent, fraudulent, intentional or with malice. As patients, we place our trust, faith, and ultimately our lives, in the hands of our doctors and other medical providers. As patients, we never dream of becoming a victim of a medical mistake. The effects of a medical mistake may be catastrophic and can result in life-long injuries, which can be physically, financially, and emotionally devastating and impact not only you, but your loved ones as well. What happens to you when you are the victim of medical malpractice? How do you pay for your continuing medical care and expenses? Who will take care of your family if the medical error causes your death? 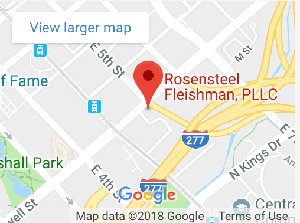 The attorneys at Rosensteel Fleishman are here to answer your questions and help you navigate your way through the legal process to ensure you get just compensation for you and your loved ones. Contact our office at 704-714-1450 for your free initial consultation.